Home / Auto Mechanic / How Much Does Mechanics School Cost? How Much Does Mechanics School Cost? A run-of-the-mill undergraduate certification course for an auto mechanic carries a price of $5,000, in addition to $500 for equipment together with textbooks. 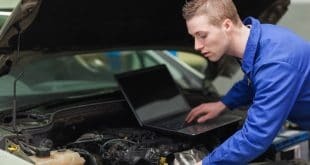 A general mechanic’s diploma (with an automobile option) or a diploma in a specialized school in the automobile sector are the main ways to access this trade. Specialists in automation, electronics, computing or materials also have their specialized training. These diplomas can be supplemented by training for more specialization or by a continuation of studies. An undergraduate certification course program focuses on practice in a mechanical workshop and will give you all the tools necessary for your success in the automotive industry. The automotive mechanics course is designed to help people wanting to make a career in the automotive industry quickly. Mechanics school cost varies depending on the areas studied. The goal of the automotive mechanic is to optimize current vehicles and to repair vehicles. There are many innovative projects: new materials, driving assistance systems, etc. An automotive mechanic must also take into account market developments and user expectations. A standard undergraduate certification training course for an auto mechanic specialist should require lessons studying: introduction to basic tools, equipment and reference manuals, introduction to fasteners and measuring tools, introduction to diagnostic equipment, welding equipment, oxyacetylene welding, theory of anti-lock systems (abs), suspension systems, steering systems, tires & wheels, theory of wheel geometry (alignment), rear axes and transmission shafts, front axles (front-wheel drive vehicles), differentials, effective communication techniques, customer care, determination of requirements, complementary services, customer satisfaction and loyalty, customer-generated revenue relationships, the multimeter, electrical systems, operation and use of the multimeter, electrical systems basics, basic electronics, batteries and accumulators, camshaft and valve drives, lubrication and cooling systems, intake and exhaust systems, engine sealing and reassembly, ignition systems, electronic systems and d.i.s., diagnosis of ignition systems, maintenance and repair of ignition systems, power supply systems, electronic fuel injection, diagnosis and repair of fuel injection systems, anti-pollution systems, preparation and implementation of a work placement and on-the-job training. The automotive mechanic works on one or several projects at the same time, from the conception to the different phases of tests. At the outset, the repair company makes a request from which he draws up a precise specification. Then comes the development part, where he repairs a system, for example. Numerous adjustments are made in relation with the various areas (body, engine, electronics, etc.) because everything is linked. For this purpose, he performs calculations and computer tests in order to define the characteristics of the parts to be repaired according to the constraints to which they will be subjected and then tests on prototypes. Innovative projects are not lacking in this field. Considered as the heart of mechanics, the automotive sector has many enthusiasts. The mechanic must succeed in optimizing what exists, but must also respect a certain number of constraints of use and regulations. The engine, the body, and the dashboard are some parts of the car that the mechanic seeks to repair. For this, he must be a technician capable of understanding complex systems, because all the functions of the automobile interact with one another. Working as a team, he must be a good communicator, but must also possess management qualities to coordinate his teams and his research, and to adapt his speech to different interlocutors. Perseverance and adaptability are necessary for this profession. This professional must also be rigorous and respect the standards and deadlines imposed on him. Vehicle transport regulations also state a number of constraints and specifications that the mechanic must abide by throughout his work. A project can last a long time. Depending on his specialization, he will work more in a workshop, to organize the repair, for example. In all cases, he ensures compliance with procedures and safety rules. He alternates between technical design, management of the repair and compliance with safety, comfort or energy optimization requirements. The automotive mechanic works as a team around a project. He must, therefore, supervise and verify the whole process, from the design to the last tests, or at least the phase for which he is responsible. At each stage, the project must either be validated or will be in development. A computer tool also allows a mechanic to carry out simulations, for example in the testing phases, or to draw up specifications and studies. But he may also be required to test innovations on prototypes under real conditions since, generally, a car mechanic follows a project from A to Z. At the crossroads of several trades, the mechanic may also be responsible for inventory management and the distribution of automotive products and supplies to a clientele of professionals, private individuals, and workshop technicians. To get started in this way, you will need to have extensive and accurate knowledge of spare parts and automotive accessories. Qualities of listening and good time management will also be assets. What Does It Take to Be a Mechanic? How Long Does It Take to Become a Mechanic?